Help me choose - Name for a website? If you are finding it difficult to choose right and best website name or not getting the name which you want as it is already registered, than don't loose hope we are here to guide you. We will provide you all the required help in choosing the right website name for you business or Blog. What all things you will require to know when registering a new website. 1. Website Name : Website name should always be unique and easy to remember and which relates to your business if possible. 2. Website Name Length : The length of your website name ideally shouldn't be more than 6-7 characters. 3. Website TLD : If you are running business or Blog and your clients or audience are from various places of the world then prefer registering your site name with .COM domain else register with country TLD name, like for India .In, for US . us etc. Also, do not use common names like information, football, education etc., the unique the name the better it is for your site in longer term. Example: Google.com, Facebook.com, Twitter.com, Yahoo.com, Microsoft.com, YouTube.com they are very unique name, so why cant we keep unique name. 5. Register Similar Names : Once you are all set to register the name, if possible register other TLDs availlable for your site name, for example if you are registering for website name: MeniPaisa.com then prefer registering menipaisa.org, menipaisa.in (Local TLD), meniapaisa.net this is helpful as in future people may register these TLD names and may take benefit of your website name and popularity. 6. Already Available Website : Thier are people who already own good website name and want to sell the website name to someone by charging higher money, if you like the old website which is available for sale then go for it if you like and think it is perfect name. 7. Long Term Registration : If you are registering for a business website then I would recommend you to register it for 5 years instead only for a year. This will help you rank better in Google Search plus people will have trust in your website. It took me more than a month to decide, choose website name for my site and I finally registered Jesoba.com I am sharing this guide for YOU, so that you don't take this much time I hope. For your information everyday 40,000 websites gets registered over internet, It means per hour 1700 websites gets registered and per minute 27 websites gets registered everyday as of the 2012 and the numbers will keep increasing. The yearly re-occurring charges for website name registration is 10 $ (500 INR) only. Click here if you have identified some website name and want to check whether they are available. - If you have decided your website name and if it is available for registration then don't wait, go ahead and register your website before someone else register it. - If you think that registering a website name for high Google search query keyword will help you get traffic and huge Adsense income then forget about it. Example: if you register for site name whatisinternet.com as lot of queries comes on Google for this query, then don't think that your website will appear on top of the Google search result page. - Do not rely on online tools which helps you find perfect and best website name, they are nothing but some online scripts which keeps generating some new web site name every time. Take sometime and think of some cool website name. I am sure this guide will help you find answers for questions like "How to name a website? ", "How do i get a website name? 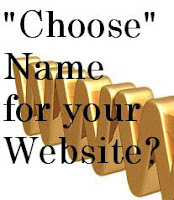 ", "How to choose website name? ", "Help me decide website name?" Please feel free to contact us for any help without any hesitation, we are here to help you. Don't worry its free help, no charges. Keep visiting!!! we will add some more update here related to help in choosing name for a website?